On the 72nd anniversary of the aerial attack on Pearl Harbour by Japanese fighters, Confederate finally announced their newest member, the C2-P51 Fighter which is the first Confederate to take birth after former Ducati designer Pierre Terblanche stepped in as its Head of Designs. 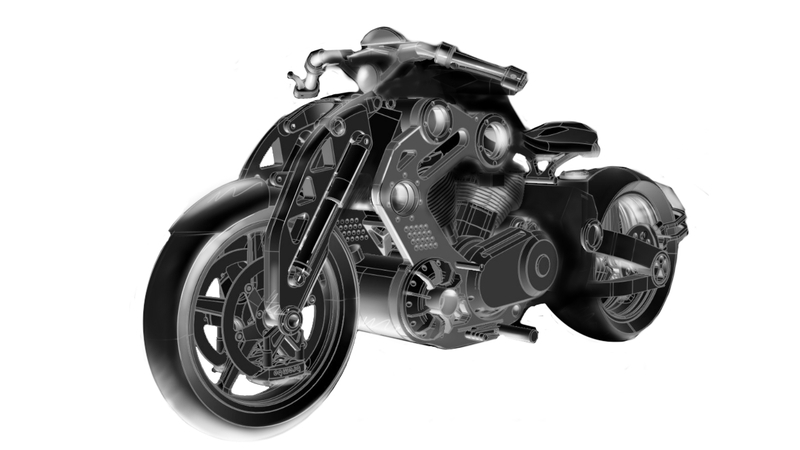 Terblanche claims that 40 pounds of fat has been sucked off from the new Fighter with the use of a new billet aluminum crankcase which decorate the V-Twin engine, and the new downdraft injection system would allow the bike to have more power and a tremendous improvement in the motorcycles handling. Confederate have not yet announced any specific details regarding the engine and other crucial numbers yet and those seem far away as well, as its still in development mode. Confederate Motor, Inc. founded by the trial lawyer H. Matthew Chambers is an exotic street motorcycle manufacturer based in Birmingham, Alabama. Although the company started in Baton Rouge, Louisiana in the year 1991, the first child of the family rolled out in November 11th 1994 from their prototype shop opened in New Orleans, Louisiana in 1993. From 1996 to 2001, the company built over 500 first generation Hellcat models. Confederate Motorcycles recovered from bankruptcy in 2003 and produced about 75 second generation Hellcats after they had gone bankrupt in the year 2001. The Confederate facility in Birmingham took shape after their previous production house was severely damaged in August 2005 when it was hit by the Hurricane Katrina. The production then resumed in 2006 with an announcement in May which promised the world of their 5 million dollar expansion plan to mould an affordable third model. In 2013, the Confederate moved to a larger facility in Birmingham. The three metal monsters that get shaped in the Confederate house are the Hellcats, Wraiths and the Fighters. The first Confederate Fighter claimed an average of 250.7kmph at the Bonneville Speedway. The B120 Wraith and F131 Hellcat marked at $92,000 won the first and second places respectively in the production manufacturer category of AMD World Championship of Custom Bike Building show at the Sturgis Motorcycle Rally in 2007. The new, second generation Fighters will be available from summer of 2014, with luck for only 31 owners in the world. With the limited details on the fighter, we have to wait and see what the famous monster with the heart and soul of aluminum, carbon fiber, stainless-steel and titanium have in store for the 31 owners who are waiting to tame their newest pet.